Many structures within the interphase nucleus have been characterized using transmission electron microscopy. Transmission electron microscopy is able to resolve the individual macromolecules that are found within the nucleoplasm. 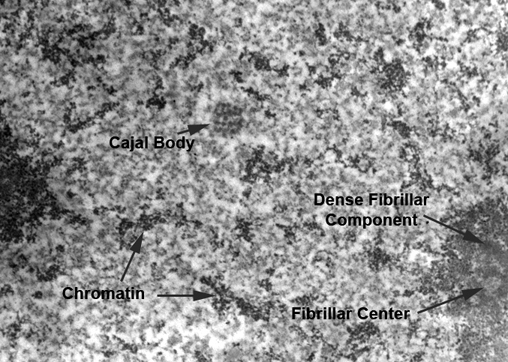 The image on the left shows a transmission electron micrograph of a Cajal body (center). The morphology of this structure gave rise to the name "coiled body", which was commonly used to describe this structure until it was recently renamed to recognize its identification by Santiago Ramon y Cajal, a Nobel Prize-winning scientist who practiced in the late 1800's to early 1900's. Click on the image to link to see images of the cell nucleus and its structures collected by transmission electron microscopy and electron spectroscopic imaging. Fluorescence microscopy is a widely available technology for studying the organization of the cell nucleus. Using fluorescently tagged antibodies to determine the distribution of specific endogenous proteins and using fluorescent proteins to study the distribution and dynamics of nuclear proteins in living cells, our knowledge of nuclear organization and its relationship to nuclear functions is expanding at a rapid pace. 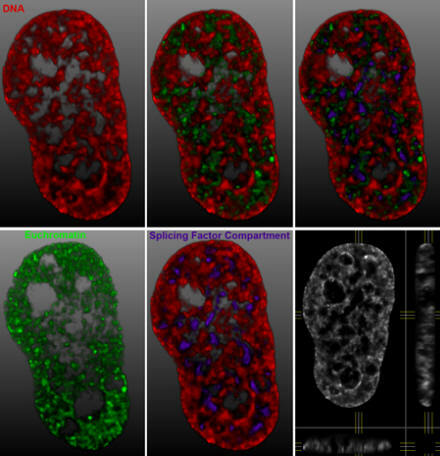 In this section, you can find images and information on the types of structures that are commonly seen in fluorescence microscopy studies on the interphase nucleus. The image shows HeLa (human cervical cancer cells) stained with an antibody recognizing histone H3 trimethylated at lysine 4 (green) and counterstained with the DNA-binding dye, DAPI (red). Splicing factor compartments are shown in purple. The images are 3-D surface projections of deconvolved data sets.